“Someone is shouting: “Clear a path in the desert! Make a straight road for the LORD our God. Fill in the valleys; flatten every hill and mountain. Level the rough and rugged ground.” (Isaiah 40:3-4 CEV) Traditionally today’s scripture was by John the Baptist to explain who he was when questioned by the Jewish leaders. But this morning let’s look it in a different light, let’s look at it in light of what Jesus intends to do in our lives. First of all by sacrificing himself on the cross for the forgiveness of our sins he “cleared a path” through “life’s wilderness” to God for us. Secondly, life as we live it day in and day out is filled with up’s and down’s of every shape and size. We know one minute we can be on top of the world and a minute later we can be in Death Valley. Take Elijah for instance, in one verse he is standing in the light of victory after defeating 750 prophets of Baal and a verses later he’s running for his life. (Read his story in First Kings chapters 18 and 19.) But no matter how low the valley is or how high the mountain may be Jesus can unearth enough of the mountain to fill in the valleys thus smoothing the path before us. And thirdly, life can be pretty rough giving us a bumpy ride. 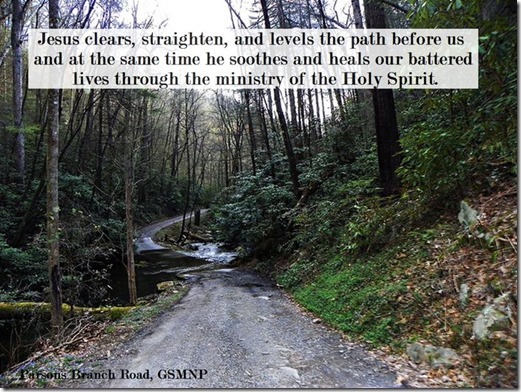 But Jesus can and does clear, straighten, and level the path before us and at the same time he soothes and heals our battered lives through the ministry of the Holy Spirit. So the very next time you read, “John answered in the words of the prophet Isaiah, “I am only someone shouting in the desert, ‘Get the road ready for the Lord!’” (John 1:23 CEV) Don’t just think about John the Baptist also think about what Jesus wants to do in and with your life.